COMEDY. A naïve boy reads a school essay to his classmates relating the events leading up to his parents’ divorce and how the new situation has turned into a real cash cow for him. 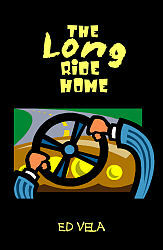 Included in the short play collection "The Long Ride Home." Ed Vela is a national award-winning playwright whose plays have been produced throughout the U.S. Mr. Vela is also an accomplished actor who has more than 30 years of experience on the stage. He resides in southern California.